Lawrence Livermore National Laboratory (LLNL) engineers have achieved unprecedented scalability in 3D-printed architectures of arbitrary geometry, opening the door to super-strong, ultra-lightweight and flexible metallic materials for aerospace, the military and the automotive industry. In a study published online July 18 in Nature Materials, LLNL engineers report building multiple layers of fractal-like lattices with features ranging from the nanometer to centimeter scale, resulting in a nickel-plated metamaterial with a high elasticity not found in any previously built metal foams or lattices. An optical image of a bulk-scale hierarchical nickel phosphorous lattice material with a network of hierarchical stretch-dominated octet unit cells. Photo courtesy of Xiaoyu Zheng and William Smith. 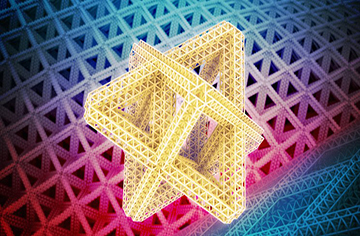 The lattices were initially printed out of polymer, using a one-of-a-kind Large Area Projection Micro-Stereolithography (LAPuSL) printer invented by LLNL engineer Bryan Moran, who won an R&D 100 award for the design. The lattice structure was then coated with a nickel-phosphorus alloy and put through post-processing to remove the polymer core, leaving extremely lightweight, hollow tube structures. Taking inspiration from the hierarchical structure of materials found in nature, such as wood and bone, the finished material incorporates multiple levels of feature size, from nanoscale films to the macroscale unit cells and lattices, within a single piece roughly five centimeters long. While testing the nickel-plated material, researchers found that structures fashioned with walls 700 nanometers thick broke under a 5 percent strain, while those with 60-nanometer walls stretched about 20 percent before failing. Besides flexibility, researchers said the concept could overcome the current limitations of 3D-printed micro and nano-architectures by addressing the usual tradeoff between high resolution and build size and extend to a variety of large-scale applications, including aircraft parts, batteries or stretchable armor for the military. Now that they’ve proven the concept works, the researchers said they could begin to scale up further to tens of centimeters and beyond, explore photonic and electronic properties, as well as incorporating other materials, including ceramics. Lab researchers William Smith, Julie Jackson, Jianchao Ye, Nicholas Rodriguez and Todd Weisgraber also contributed to the paper, which had additional collaborators from Virginia Tech (grad students Huachen Cui and Da Chen) and the Massachusetts Institute of Technology (Nicholas Fang). The Laboratory Directed Research & Development (LDRD) program, the Defense Advanced Research Projects Agency(link is external) (DARPA) and Virginia Tech startup provided funding for study. To get the latest updates straight from key stakeholders, sign up for Additive Innovation 2016! This post originally appeared on llnl.gov and has been re-posted here with permission.